Click here to download Dog Ate My Homework Today! Homeworks are a chore! 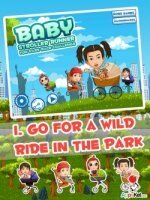 After spending sometime finishing the grueling task, you wish to play with your cute and innocently-looking dogs. BUT to eat your homework! “Oh no! My dog ate my homework! Will you make another one? No! Go to school without it? No! The best thing to do is get back your homework! But to do that, you have to find the right dog who ate it! This simple game of speed will test your eyes and reflexes! 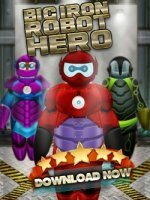 A game that gets challenging every time you get the answer right! Can you figure out which of your cute & adorable dogs ate your homework? 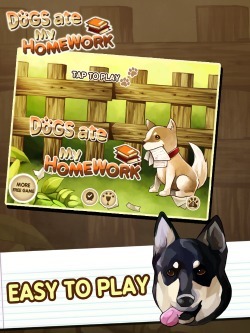 The challenge - every time you find the cute and furry culprit who ate your homework, the game speed goes faster.The more that you catch the right dog who ate your homework, the more points you acquire and the more challenging it gets! Can't follow them? Try to guess it and test your luck! Unless, you want all the hard work you gave into your homework lost in the hungry tummy of your furry best friends! 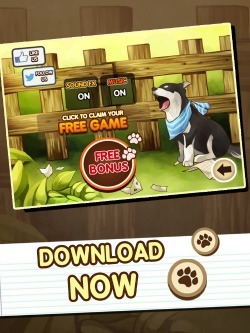 Unlock all the 12 cute and adorable furry doggies in the game and tell us who you find the cutest and most irresistable! Shiba - "Wow, is that homework? Wow, is that tasty? Wow, me want to eat homework! Yummy!" Cody - "I am a smart puppy! I like to read master's homeworks. I like it even more when I eat them, makes me a lot smarter!" Daisy - "Is that your homework? Is it okay if I take a little bite? I won't eat them all. I promise." Lucky - "Hey, hey! You wanna play? Oh wait, you have to finish your homework first right? After you're done with it, I'm takin' a bite!" Gus - "Homework? What's that? It was there a moment ago? Hmmm, was that the yummy treat you left at your table?" Bella - "Arf, arf! Am I pretty? Am I cute? Yes? and Yes! Can I eat your homework? Yes!" Henry - "Huff, huff, puff! So tired of running around, I need something for a quick bite. Homework! Yum!" Chop - "I'm gonna guard your homework from the others! Nomnomnom! Now they're in my tummy and others won't steal 'em!" Oliver - "I'm not sharing my food! Oh, hmmm, is this your homework?" Roxy - "No need to finish your homework master, Little Roxy will finish them up for you!" Buster - "Quick! Run! Hide! I was the one who ate the homework! It's a secret, okay?" Lassy - "Are you done with your homework? Can I eat it already? Arf!" In-app purchases available to unlock the rest of the cute puppies! Don’t forget to give us a rating in the App Store! 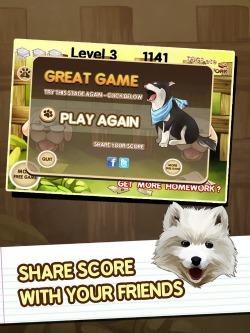 2 Versions of Dog Ate My Homework are now available for download on the Apple Appstore.